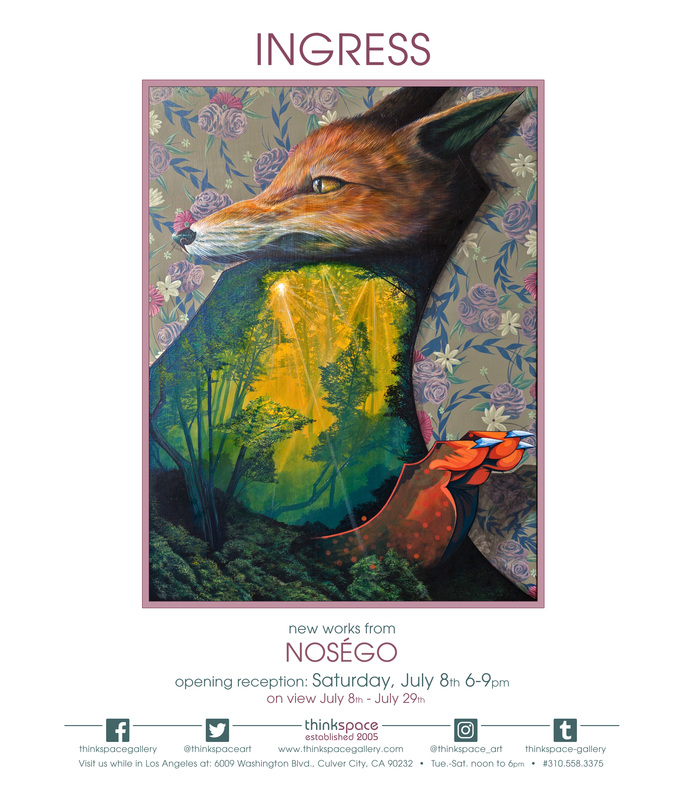 Thinkspace (Los Angeles, CA) – is pleased to announce Ingress, a solo exhibition of new works by Philadelphia-based artist and muralist, Noségo, otherwise known as Yis Goodwin. His unmistakable work is character-driven, featuring creature hybrids assembled from animals, cartoons, landscapes, and even architectures. These bodies are aggregates of parts and oppositions, and reference themes like urbanism, the vulnerability of nature and the wild, mysticism and healing, mythologies, and art history. Unlikely visual and cultural worlds collide and fuse in Noségo’s creative mashups, where objective realities are disassembled, fractured, and freely restored through the disinhibition of play. Noségo’s paintings and large-scale public murals are executed in acrylic with both aerosol and brush painting techniques. A gifted illustrator, he meshes a graphic illustrative style with a technical skill for realistic rendering, bringing his imagery to life through intense and contrasting styles and palettes. 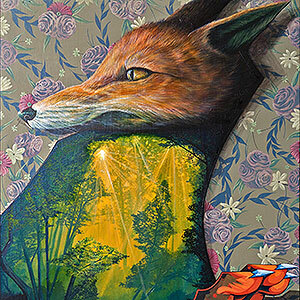 Virtually explosive in the fervency of their color and detail, the works are busily frenetic, humming with energy. They contain worlds within worlds and reveal microscopic moments hidden within the bursting textures of the whole. These are often as subtle as shifts in patterns, motifs, and variations in light. The cumulative multiplicity of his work owes as much, if not more, to the eclecticism of his stylistic freedom. The contemporary city is always an internal armature, however, a reference that hinges everything together through color, subcultural vibes, graphic sensibility and composition. Amidst those bones are hung traces of folklore, landscape painting, references to craft and domestic space, allusions to the celestial, kids toys, and a taxonomy of wild animals – ranging from the realistic to the caricature – rivaling that of a natural history museum’s. There is something vaguely Utopian about these creatures and the shape-shifting worlds Noségo anchors together, even when verging on the grotesque. Absolutely everything is possible, and nothing is so irreconcilably different or absurd that it can’t ultimately coexist within a single frame. There are moments of darkness that emerge, particularly in imagery that deals more directly with themes of division and dissociation, but these shadows seem placed in the service of lawless dissonance and playful absurdity rather than despondency. His cross-sectioned animal hybrids, for instance, appear literally spliced as stacked segments, but even these feel mischievous rather than pained, and closer to a childlike fascination with deconstructed toys than anything belonging to the realm of gore. As the title of the show Ingress suggests, the artist’s work is about revealing and clearing entry points into elastic fantasy worlds rather than obstructing or circumscribing them. Each painting offers alternate realities in which to get lost, with countless ways to interpret and follow its loosely defined paths. Noségo invites the viewer to create their own story, to engage his visual world freely and as ecstatically as he creates it. The work, in all its beautiful strangeness, is open admission to a constellation of worlds.